This was the first year for the Marlovians playing within the Maidenhead club structure. The year had started with them playing as the Marlow Mariners in the indoor league, but moved over soon after to become part of the MSC. A move that by the time August came around had yielded their best season in the Windsor League. Bolstered by some of last years Maidenhead Rebels and a Royal to prove some more experience, the Marlovians opened the 2015 campaign with an impressive 19-8 win of RP Hawks. The impressive scoring power of the Marlovians would appear time again all year and lead to them being the second highest scorers in the league, only the first placed Rattlesnakes would score more all year. What impressed in the first game was their ability to defend, again only the Rattlesnakes would concede fewer runs all year. Week two and the the BA Flyers became the next team to fall 23-8 as the Marlovians came from 5-2 down. At this point both Rebels and Marlovians were on winning runs but it was the Marlovians who topped the table thanks to their offensive power. As the first month of the season ended a third win in row, 24-9 against RG Blue Sox 2, kept them top and on a high going into a big clash with the Rattlesnakes. June 4th saw the eagerly anticipated table topping clash against the Rattlesnakes, a game that eddied and flowed and didn’t disappoint. It was the Rattlesnakes who came out on top, 18-16, handing the Marlovians their first defeat of the year and knocking them off top spot for the first time. Their second defeat wasn’t long in coming, a 15-14 defeat away at Bracknell Scorchers put the Marlovians below Rebels for the first time this season, with the club derby to come. The first club derby of the year was not quite the game everyone hoped, the Marlovians found their defensive skills and the Rebels had no answer to their batting. The 23-7 result was a fair reflection on the game and put the Marlovians above their fellow club team again, a position they would not loose again. The return fixtures started badly for the Marlovians, a disappointing away trip to RP saw them loose their 3 game in their last 4 and with defeats already to Rattlesnakes and Bracknell, a title run was starting to slip away. A double header was next on the schedule and two wins against Farnham Firebirds put them back in with a chance of at least a runners-up spot. That chance seemed to be more real as they completed the double over BA Flyers with a 22-18 win at home. The Marlovian season was defined in the final weeks of July, it was a poor month as they went on a 3 game loosing streak, first falling to the RG Blue Sox 2 18-16, then loosing the return games against Rattlesnakes, 33-20 and Bracknell 17-14. That final result, all but sealed any chance the Marlovians had of a top two finish, with just the return derby to come, 3rr place was the best they could hope for. The return derby was a much closer affair, the Marlovians completed the double over the Rebels, 18-12, and ended their campaign on a high. A week later, the Rebels did them a big favour by beating BA Flyers in a make up game to hand 3rd place to the Marlovians. All in all this was a fantastic season for the Marv’s, they achieved their highest finish, their most wins in a single season, most runs scored and fewest conceded. There were some outstanding performances, not least from Evan Harvey. Coming over to help from the Rebels, Evan won both the league MVP for the team and the team MVP award. On the female side, Natalie Birch mirrored Evan’s achievement and took both the female awards. 2016 holds great hope that the Marlovians can go at least one better and finish runners up, although the Rebels will probably have a say in that. 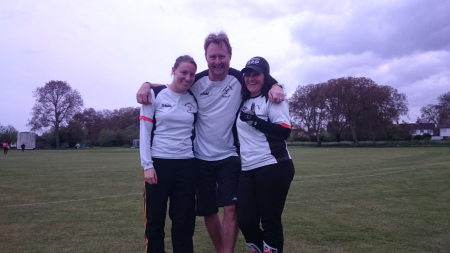 This entry was posted in Club News, Marlovians, Season Review and tagged Maidenhead Marlovians, Season Review, Taster, Try Softball on December 10, 2015 by maidenheadsoftballclub.